Player Ratings: if it wasn't already clear, one area of the pitch is really letting Sunderland down right now..
On reflection it was a great game to watch, but Sunderland should have put this game to bed before half time. Yet more desperate performances from fullbacks cost us. 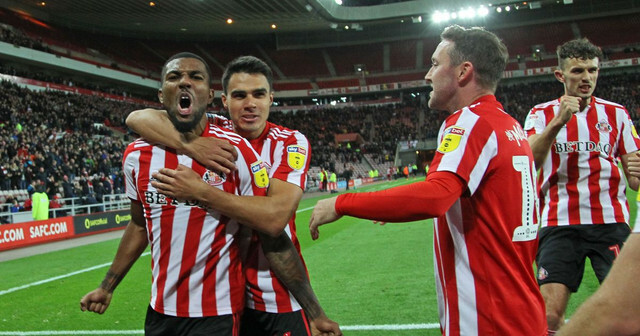 Sunderland threw away the opportunity for three points against automatic promotion rivals Peterborough in a feisty affair. The Stadium of Light was in fine voice. The first half was not typical of the lads this season, we started on the front foot and stayed that way until the interval. Josh Maja's eighth goal of the season puts him top of the goal scoring charts in League One, with the same number of goals as Doncaster's John Marquis, but done so in fewer minutes and backed up by an assist. Sign the contract pls. It was less than what we deserved in a dynamic performance throughout opening period. Jerome Sinclair missed a sitter after another fantastic move, which featured some marvellous wing play by Aiden McGeady who, alongside Chris Maguire, caused problems all half. Peterborough finally began foraging forward early in the second half but we stood firm. Jack Ross pointed to the resilience shown in his post match thoughts. However, idiocy from Bryan Oviedo gave the away side a man advantage which they capitalised on. In truth, both goals were avoidable - particularly the first which appeared to go out for a throw in before the cross was played. Touching on that decision, the referee was so poor I'd have even took Andre Marriner instead. Yes, he was that bad. So it ended an acca-busting draw and another chance for three points dropped. If you're ever considering putting Sunderland on your acca, make sure you look at acca insurance that is on offer, because there's a good chance you'll need it! Anyway, on to the player ratings - let me know who you thought was man of the match in the poll at the end. Not sure he could have done a great deal about the goals, pulled off one excellent save in the second half and generally looked comfortable. Part of a centre back pairing that looked solid but was left vulnerable by the full backs. Looked assured, didn't panic. I like him at centre back but I also think he's our best right back at the moment! Really poor again. Was lucky in the first half when hooking a pass back to McLaughlin, he had no idea a Peterborough defender was there and almost gifted a goal. Generally decent but that was probably the most ridiculous and petty sending off I've seen for a while. Ridiculous. Looked much better alongside Power, the two worked well together. He was more of a presence and this was probably his best performance for Sunderland. Ran the show at times. Always made sure he was available for the pass, released the ball quickly. He was incisiveful, decisive - really good midfield performance. Looked dangerous in the first half but as Peterborough began finally putting on some pressure he became a bit useless. Showed great intelligence on the ball and, at times, quite sublime technique. His touch, turn and pass to set up Jerome Sinclair was majestic and a piece of play that deserved to shine on any stage in football. Super stuff. Didn't quite come off for him in the first half, but he worked tirelessly and really put Peterborough under pressure without restbite throughout. Superb finish. Jermain Defoe aside, this kid is the best finisher we've had for quite a few years. He needs to work a lot on his link up play, but in front of goal you can't fault him. His awareness to throw off the defender, before finishing expertly, was great. Struggled a lot, it showed that he is our third choice left back. Being down to ten men, and expecting Aiden McGeady to support him, probably didn't help to be fair. Had just a handful of minutes on the pitch, but might have scored with marginally quicker reflexes. Enjoyed his little cameo which featured a bustling run down the wing before yet another daft referee decision went against us.